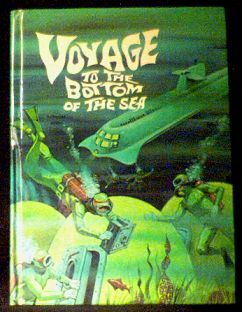 Whitman tv adventure novel featuring the popular undersea sci-fi tv show. Small piece of clear cellophane on book's binding has separated and come off, otherwise this book is in near perfect shape with no worn edges. This program was inspired by the movie and starred Richard Basehart and David (The Fly) Hedison. The show was really good in it's first season, but eventually they started getting hard up for new storylines and were reduced to a "Monster of the Week" format. Website design and hosting by Sohodojo Business Services. Item 452 of 466 items displayed in viewer. 0 items in cart.